Animated cartoon series based on Marv Wolfman and George Pérez's original THE NEW TEEN TITANS series in 1982. Series will debut on Cartoon Network on 19 July 2003, and then again in August on Kid's WB. (12/4/2003): Season two is rumored to have the whole season adapted to NEW TEEN TITANS: THE JUDAS CONTRACT. (12/8/2003): KIDS WB is airing TT at 3pm, starting 12/8/2003. Following are Teen Titans episodes scheduled for Cartoon Network in July, subject to change. * Wednesday, July 5: "Date with Destiny" at 2 p.m., "Transformation" at 2:30 p.m., "Titan Rising" at 3 p.m., "Winner Take All" at 3:30 p.m.
* Saturday, July 8: "Wavelength" at 10:30 a.m., "Titans Together" at 11 a.m.
* Wednesday, July 12: "Betrayal" at 2 p.m., "Fractured" at 2:30 p.m., "Aftershock, Pt. 1" at 3 p.m., "Aftershock, Pt. 2" at 3:30 p.m.
* Saturday, July 15: "The Beast Within" at 10:30 a.m., "Things Change" at 11 a.m., "For Real" at 5 p.m., "Deception" at 5:30 p.m., "Bunny Raven ... or ... How to Make a Titananimal Disappear" at 6 p.m.
* Wednesday, July 19: "Deception" at 2 p.m., "X" at 2:30 p.m., "Bethrothed" at 3 p.m., " "Crash" at 3:30 p.m.
* Saturday, July 22: "Can I Keep Him?" at 10:30 a.m., "Divide and Conquer" at 11 a.m.
* Wednesday, July 26: "Haunted" at 2 p.m., "Spellbound" at 2:30 p.m., "Revolution" at 3 p.m., "Wavelength" at 3:30 p.m.
* Saturday, July 29: "Bunny Raven ... or ... How to Make a Titananimal Disappear" at 10:30 a.m., "Sisters" at 11 a.m. Teen Titans TV Series Cancelled? Days may also be numbered for Justice League. Reports have begun circulating that the Cartoon Network has passed on their option to produce a 6th season of the animated Teen Titans series. Rumors had been circulating about the fate of both Teen Titans and Justice League Unlimited since previously announced new episodes have been quietly removed from the Cartoon Network schedule. Repeats should still run on the network and a promotional push is expected when the network finally programs the last new episodes. The Teen Titans fan site, TitansGo, received the news from a member of the production staff last night and reported the news today. Calls from IGN to Cartoon Network for comment on the news had not been returned by press time. According to the Titansgo.net Website the Cartoon Network has declined to order a sixth season of the Teen Titans animated series. Based on the DC comic, which is currently a fixture in the Top 25, the Teen Titans animated series with its anime-style graphics and tween-friendly storylines appealed to a younger demographic than the comic book. Fans of the series are circulating an online petition, but even if the Cartoon Network doesn't change its mind, the Teen Titans animated series will likely remain available thanks to reruns of the more than 67 episodes already aired as well as on DVD. The first season of the Teen Titans Animated Series on DVD will be available in February of 2006. Bandai America, which has released toys as well as a collectible card game based on the Teen Titans animated series, and DC, which publishes the comic, may benefit from the attention if fans heed the urging on fan Websites to buy more Teen Titans merchandise to show support for the show and help keep it on the air. Longer term, the fate of the licensed merchandise will depend on how TV exposure changes and the degree to which that change affects sales. CN'S TEEN TITANS - NO SEASON SIX. According to Titans Tower.com and other various sites, it appears that Cartoon Networks’ Teen Titans series will soon meet the fate of other Warner Brothers’ animated series and go quietly into dead air. It's being reported by numerous sources (Titans Tower, TitansGo.net, Toon Zone) that Cartoon Network has decided to pass on a sixth season for the animated series, leading to a petition drive to save the show. News: Teen Titans Cartoon Not Renewed? Once again Warners Animation is casting its lot with the American boom in interest in Japanese anime and manga. This works in the Teen Titans animated series (see "Comics in Context" #52: "Mod as a Hornet"). I note the irony that when Marv Wolfman and George Perez created The New Teen Titans in the 1980s, they sought to make most of the Titans look and act as adult as possible; the TV show basically uses the Wolfman-Perez team (while, of course, not bothering to credit them), but presents them as kids, so the cartoony anime look seems appropriate. But then Warners launched its new series, The Batman, which is really a reboot of the continuity of the already classic Batman animated series of the 1990s. The new Batman series casts aside the handsome, Kirby-influenced style in which Bruce Timm and others designed its characters for a look that combines Japanese and contemporary American influences. In other words, it looks like a 1990s Image comic to me, and the characters look somewhat grotesque compared to their Timm counterparts. The 12th Annual Wizard Fan Awards are here, and it’s time for fans to determine what ranks as the best in the comics world from 2004. You know the rules. Each category contains five nominations as determined through a poll at www.wizarduniverse.com. Vote for one and ONLY ONE entry in each category. Multiple votes in any category disqualify the entire ballot. Feel free to take matters into you own hands in the “write-in” category and you don’t have to vote in every category if you don’t want to, but you only get to vote ONCE! Multiple ballots will be disqualified. Click here or on the image to the right to cast your vote today! "I knew I wanted to do something with them, so we did some development for what I thought would be an Adult Swim series," continued Register. 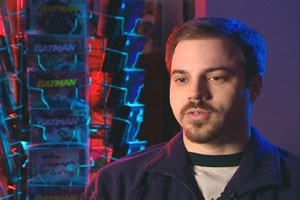 "We went in that direction and, while we were doing the Puffy pilot, we were working on the Teen Titans show. 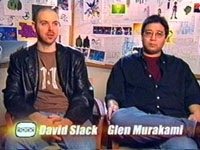 The Teen Titans were so anime influenced, when the time came I encouraged Glen Murakami to listen to the band, told him about the pilot and how that might not happen, but thought we should get the girls to do the Teen Titans theme song. He was all into it, so we went ahead and had them do the song." Register explained, "We have a lot of things in development and many will never be made into series - it's like many will enter, few will win. We only put two or three new shows out a year, so obviously everything in development is like playing the Lotto. Puffy at that point was on the fence. I thought it wouldn't happen. They did such a great job on the song for the Teen Titans. It came out and it was so addictive. It really helped that so many people were singing the theme songs, it was one of the great things about the Teen Titans cartoon. It was like bringing back a Brady Bunch type theme song. Everyone loved it and it really pushed Hi Hi Puffy AmiYumi show that much closer to getting greenlit. We did a pilot on the Teen Titans DVD now and the rest is 26 episodes history." BW: Were you a fan of the comic book series? David: One of the reasons they brought me on is that I'm NOT a comic book guy. I've read some -- I've read a lot, actually, now. I wasn't into comic books much though. Instead, I was reading science-fiction. I knew about the Teen Titans through their one appearance on - was it the Superfriends? - when we were much younger. Anyways, I was a big Spider-Man fan growing up. So I was pretty unfamiliar with the Titans growing up. So I dug into a huge stack of the stuff that George [Perez] and Marv [Wolfman] had done - all of which is entertaining and brilliant. Really cool to look at and really revolutionary. My role on the show was that when Sam and Glen would get into some argument about "What Super-Adaptoid could and could not do" to sit there and go, "Guys, no one knows what you're talking about anymore." We wanted the show to appeal to a broader audience so we didn't want to get too lost in the Titans mythology of stuff. So one of the things I brought was UNfamiliarity with the property. And I think that helped bring a fresh perspective to things. "But we were able to find our way of doing it that fit our show and I think we still honored what that character of Terra was: a lost, mixed up teenage girl whose a lot stronger than she realizes." That said, I've really enjoyed working with Marv, who's a great writer. And we've done our best at every turn to honor the spirit in which that original comic book was created. Like the stuff we did with JUDAS CONTRACT. For a lot of reasons, we couldn't do what they did in the comic book exactly. For one thing, they did it very well so what's the point in doing it again? But we were able to find our way of doing it that fit our show and I think we still honored what that character of Terra was: a lost, mixed up teenage girl whose a lot stronger than she realizes. INTERNATIONAL POP OVERDOSE: TEEN TITANS GO! I’m jumping the shark. Okay, so I’m not really going to get on skis in a leather jacket, and I’m already rethinking the use of that woefully beaten-to-death phrase. Actually, I guess you could say that I’m “straying from the mission statement.” A bit. Last time, I was able to justify covering The O.C. because of the comic references and a set DVD release date. So how do I explain myself now? Just like a high school kid who drags in from a party smelling like a brewery, I’d better have a pretty good reason. And I do. This week’s topic, Teen Titans has its first DVD in the works, and hails from a line of several animated appearances. And there’s the whole thing about Jen asking me to cover Teen Titans. Therefore, in the name of Contino, I cover a DVD that hasn’t even come out yet. Tolerate, won’t you? Then, in 1980, the Marv Wolfman and George Perez run of The New Teen Titans began. DC found themselves with a mega-hit that’s still fondly remembered as one of the bright lights of the comic form. 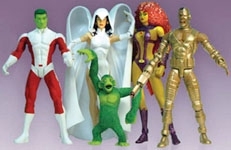 The line-up proved so popular that Cyborg was even added to the final season of Super Friends (and even granted an action figure) in 1985. Dubbed The Super Powers Team: Galactic Guardians, it was the last season of that long-running show. Marv Wolfman has a sample of TEEN TITANS CARTOON SHOW THEME SONG by PUFFY AMIYUMI on his weblog for March 2. This weekend's new episode "Winner Take All," airs at 9PM on Cartoon Network, and features everyone's favorite underwater-fish-talking-guy, Aqualad! I can't recall if I wrote about this, or if I just talked about it with some friends, but I am incredibly proud of the work I've done on Teen Titans, and I am so grateful that I get to be part of it. The last time I was over there, when I was walking from my car to the studio, someone called out to me, "Hey! Aqualad!" and the biggest smile filled my face. It was quite a contrast: when someone calls out, "Hey! Wesley!" I sort of look at the ground and wish I was invisible . . . but when this unseen person called me "Aqualad" my heart jumped, and I looked around to see who said it. The Teen Titans animated series helped Cartoon Network claim the 2003 top ranking for prime-time delivery of kids 2-11 (1,058,000), boys 2-11 (709,000) and boys 6-11 (484,000) for the fourth straight year. Prime time delivery of kids 6-11 (635,000, up 2 percent) also earned the network a No. 2 ranking among ad-supported cable networks. 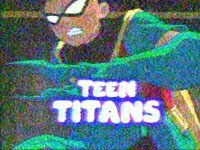 Teen Titans, which premiered on July 19, averaged double-digit growth across all demographics versus 2002 time periods. Kids 2-11 average delivery (1,021,000) and ratings (2.6) both improved by 30 percent. Kids 6-11 delivery (653,000) expanded by 47 percent and ratings (2.7) by 50 percent. Tweens 9-14 delivery (522,000) grew by 68 percent and ratings (2.1) by 75 percent. Look for more Teen Titans news soon here in The Continuum. Ashley Johnson will provide the voice of Terra in the upcoming second season of Cartoon Network's Teen Titans animated series. Johnson, 20, is perhaps best known as Chrissy Seaver from the sitcom Growing Pains. She has provided the voice of Gretchen in Recess. Terra will be featured in "Terra," the episode scheduled to premiere on Saturday, Jan. 24. I was watching television and as advertised by Kid's WB!, the TEEN TITANS ANIMATED SERIES will be airing and hosting all next week, starting Monday, December 8 to December 12, at 3PM. The series debut on Saturday, Nov. 22nd, for Kids WB, but from what I understand did poorly on the Nielsen ratings. Kid's WB's Teen Titans page is offering free wallpapers. This was printed in COMICS BUYER'S GUIDE #1556 (12 Sep 03), their website can be found at www.comicsbuyersguide.com (you need to accept their cookies). Click on the image to read the rest of the comic strip by Briz. There's lots more cool stuff on the new Puffy AmiYumi album, NICE., due out on August 12, including "Tokyo Nights" and "Your Love Is the Drug" (Your favorite radio stations should have dvances of these tracks NOW.) NICE. was produced by power pop whiz Andy Sturmer, the former Jellyfish drummer. It contains 15 minutes of live video footage from Puffy AmiYumi's 2002 North American tour and features remarkable new artwork, inspired by John Lennon and Yoko Ono's famous Bed-In for Peace, exclusive to the North American edition. You can pre-order NICE. at Amazon.com or www.bar-none.com. And you can check out more info about Puffy AmiYumi at www.puffyamiyumi.com. Have a NICE. day! August 1, 2003 | Teen Titans Go! TORRES, NAUCK, STUCKER TEAM FOR TEEN TITANS GO! Cartoon Network's premiere telecast of its new series Teen Titans on Saturday earned what the network called "powerful ratings increases across all target demos," according to Nielsen Media Research. The program earned double and triple-digit delivery and ratings gains among kids 6-11 and 2-11, and stands as the most-watched Cartoon Network premiere ever with boys 6-11. Additionally, the Sunday replay at 10 p.m. ranked as the most-watched program in its time period on ad-supported basic cable with kids 6-11, kids 2-11, boys 6-11 and boys 2-11. I've been sent two preview episodes of TEEN TITANS: THE ANIMATED SERIES. The operative word here is: FUN! The bouncy high-energy feel of the show is pure infectious fun. Now, as many of you know, I'm a long-time fan - and, like many - my favorite era is the Wolfman/Perez classic comics. The cartoon show draws from from that era for inspiration. The key word here is inspiration. The basic 'feel' of all the characters are there... but it's like they've been steamlined and de-aged a bit. When "Teen Titans" bows on Cartoon Network this Saturday fans will get a DC Comics animated show unlike the ones they've grown accustomed to starting with the dark "Batman: The Animated Series." Bright, colorful and bursting with spastic energy, "Teen Titans" is heavily influenced by anime and geared towards younger viewers. Cartoon Network has provided C2F/CBR News with this Q & A session with Glen Murakami, producer of the show, who talks about crafting a new kind of cartoon superhero series. Glen Murakami (GM): We're trying to tell stories that kids can relate to - by using problems that real teenagers have. For example, we'll deal with things like sibling rivalry and bullying, but not in an "after school special" kind of way. Our take is that the Teen Titans are real kids who just happen to have superpowers. WIZARD: THE COMICS MAGAZINE #143 Wizard posted their full article about the Teen Titans Cartoon on their website: Smash of the Titans (July 11, 2003). The article was originally published in WIZARD: THE COMICS MAGAZINE #143 and excerpts of the article appeared here: June 25, 2003 | TT Toon Article in Wizard #143. Then watch for the show on Cartoon Network Saturday, July 19th at 9pm EST. Cartoon Network has released another promotional image from the upcoming Teen Titans animated series. Click on the image for a larger and fuller image. July 6, 2003 | Static to Appear in TT? Static to appear in Teen Titans? "Also, be on the lookout for other familiar faces, including Captain Marvel Jr., Hawk and Dove, a shocking 'Milestone' DC character.. .and that's just the beginning!" So it looks like Static from the old Milestone line will finally be hanging out with the Titans. There was some talk of this happening during the last incarnation (or was that with Young Justice? ), but it never came to pass. Personally, I think it's a great idea. They should make him a full member. He has a successful cartoon but nowhere for readers to see him. Well, summer is finally here. That means steamy temperatures, a slower pace . . . and larceny. This summer's item du jour, at least as far as the MTA is concerned, are posters advertising Cartoon Network's "Teen Titans" series, which have been disappearing from subway stops and trains at an alarming rate. The series won't debut until July 19 (9 p.m.), but already the posters are being swiped daily. Since the ad campaign began about a week ago, the MTA has requested an additional 1,000 posters to replace those stolen from subways and trains. There's even a web site, dccomics.com, that lists where posters are still available (to be ripped off?) - and they're available on eBay. "Teen Titans," based on the comic book series, is being produced under the guidance of Glen Murakam ("Batman Beyond"). When "Teen Titans" hits the small screen in a few weeks, fans will be greeted with a funky Jpop theme song by Tokyo-based duo Puffy AmiYumi. Singers Ami Onuki and Yumi Yoshimura have enjoyed chart-topping success in Japan, and began their crossover to the U.S. last year with their compilation disc "An Illustrated History." Their new album "NICE" features "Teen Titans Theme," an English-language track created for the new Cartoon Network series. The track is said to be "a shout-along instant classic that somehow manages to blend the spy-movie cool of Johnny Rivers' 'Secret Agent Man' with the adolescent excitement of the Bay City Rollers' 'Saturday Night.'" Titans fans can hear a sample of the track playing as the opening of the Cartoon Network's official Teen Titans website. "Teen Titans" makes its debut Saturday, July 19, at 9 p.m. (ET, PT). Cartoon Network has released its programming schedule for August, which includes descriptions of four new episodes of Teen Titans. Saturday, August 2: "Divide and Conquer"- Cyborg quits the Teen Titans after getting into an argument with Robin, and allowing Cinderblock to escape. Cinderblock returns to his mysterious boss Slade with his prize: a sleeping inmate who becomes the monstrous Plasmus whenever he is awakened. Can the Teen Titans handle the Plasmus without Cyborg on their side? Saturday, August 16: "Forces of Nature"- Dark clouds blow in, bringing Thunder and Lightning, two stormy brothers looking for a good time. Unfortunately their idea of fun is wrecking everything in sight. Meanwhile after one of Beast Boy's practical jokes misfires, Beast Boy learns his lesson. Can Beast Boy teach Thunder and Lightning his lesson before Slade harnesses the brothers' power to unleash a monster? Saturday, August 23: "Sum of His Parts"- Cyborg is reminded he's not completely human, when his power cell dies during a wild junkyard battle with the Amazing Mumbo. The Titans fear Mumbo has taken their friend, and search the city for Cyborg. 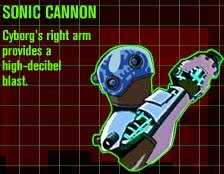 But Fixit, a cybernetic hermit who finds and repairs broken things, finds Cyborg. When repairs are complete, will Cyborg be human at all? Saturday, August 30: "Nevermore"- Raven's creepy tantrum of crackling black energy leaves Dr. Light begging for mercy, and the Titans see a new side of Raven- her temper. But, when Cyborg and Beast Boy find a Mysterious Mirror in Raven's room, they're suddenly transported to a strange nightmare world that's somehow connected to Raven. Will Raven be able to guide the boys home, or will her "personal issues" destroy them all? A young new breed of super-heroes comes to life on Cartoon Network as famed Robin leads fellow young teens Cyborg, Beast Boy, Starfire and Raven in the all-new high-adventure series Teen Titans. Slated to debut on Cartoon Network on Saturday, July 19, at 9 p.m. (ET, PT), this action-packed half-hour animated series is being produced by Warner Bros. Animation under the guidance of Emmy Award-winner Glen Murakami. The Teen Titans live together in a high-tech command center that is also the ultimate hangout. They play video games, squabble and leave dirty dishes around. They get on each other ' s nerves ... a lot. But ultimately, the Teen Titans have to put their super-insecurities and super-gripes aside and save the world from a next generation of bad guys. Teen Titans is based on the popular DC Comics comic book characters and will air in 2004 on Kids' WB! The series premiere of Cartoon Network's Teen Titans, "Final Exam," will give viewers their first look at four villains. Lauren Tom does the voices of Jinx and Gizmo, Kevin Michael Richardson does the voice of Mammoth and Ron Perlman does the voice of Slade. Andrea Romano, the show's voice director, provides the voice of Hive Academy's headmistress. "Final Exam," which airs on Saturday, July 19, is written by Rob Hoegee and is directed by Michael Chang. Look for more on the show very soon here in The Continuum. Teen Titans' second episode, "Sisters," deals with Starfire's sister, Blackfire, who seems to click with all the Titans better than she does but possesses a secret of which they are unaware. "Sisters" is written by Amy Wolfram and is directed by Alex Soto. 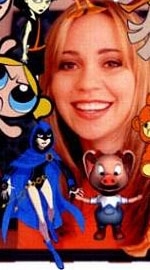 Hynden Walch, who does the voice of Starfire, also provides the voice of Blackfire. Rino Romano, who starred in Spider-Man Unlimited, provides a guest voice. The official Teen Titans website updated their Robin Section on Friday. Glen Murakami, producer of Cartoon Network's Teen Titans animated series, said that Robin will not be associated with Batman in the show. "In Teen Titans, we don't even really think of Robin as part of the 'Batman and ….' team," he said. "I'm trying to treat him as a brand new character that people have never seen before. He's the leader instead of the sidekick. He's independent. He's not in the shadow of his father figure, nor is he going to react in the same way Batman might." Murakami's comments were part of a question-and-answer provided by Cartoon Network about the series, set to launch on July 19. To read the complete interview, CLICK HERE. * To read character descriptions from the show, including villains, CLICK HERE. * Ron Perlman, who is currently filming Hellboy, does the voice of Slade, the Titans' arch-nemesis. Wil Wheaton does the voice of Aqualad, and Clancy Brown and Tom Kenney are also providing guest-voices. * Directors on the show include Michael Chang, Ciro Nieli and Alex Soto. Writiers include David Slack, Amy Wolfram, Rob Hoegee, Adam Beechen, Tom Pugsley, Greg Klein, Rick Copp and Marv Wolfman. * Look for more on Teen Titans on Friday here in The Continuum. DC Comics' "Teen Titans" is set to make its animated debut on Cartoon Network in less than a month. Being a member of the press sometimes has its perks. The "Teen Titans" press kit has us wondering if the west-coast city that the super-kids inhabit is Coaster City. In addition to the usual screener tape, colorful folders and materials, the "Teen Titans" kit also came with a set of five coasters, each depicting a member of the team, all contained in a nice metal canister. Click the images for a closer look. "'Teen Titans' features five teen superheroes each with special powers. Led by Robin, this group unites to form a force to protect their teeming, sun-baked city from a new generation of villains while coping with the challenges of adolescence. When they work together as a team, their powers are formidable. As superheroes, the Teen Titans are fully developed. But they struggle with the same challenges every teen would - things like sibling rivalry, taking responsibility, jealousy and fitting in with the group. 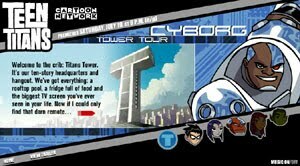 "The Teen Titans live together in a high-tech command center that is also the ultimate hangout. They play video games, squabble and leave dirty dishes around. They get on each other’s nerves… a lot. But ultimately the Teen Titans have to put their super-insecurities and super-gripes aside and save the world from a next generation of bad guys." "With Teen Titans, we wanted to create a new take on the animated superhero series. Teen Titans will be more about what the characters are experiencing and feeling right now, as opposed to being wrapped up in backstory," said Glen Murakami, producer of Teen Titans. "These superheroes don’t have alter egos or secret identities. The show is lighthearted and fun, with new villains, a bold look and exciting action sequences. We think it will have broad appeal - not just to fans of the comic books but also to kids who don’t know who the Teen Titans are." Supervillains. Teen angst. The occasional zit. These are the challenges facing the young heroes of "Teen Titans," the brand-new animated series that will launch on Cartoon Network on Saturday, July 19. Once the decision to go with Robin was made, the rest of the roster fell into place. "Because this is the Batman universe, Wonder Girl and Kid Flash were immediately out," explained Register. "And being a fan of the Marv Wolfman/George Pérez [New] Teen Titans, I definitely wanted Beast Boy, Cyborg, Starfire and Raven. We'll introduce some other teenage superheroes from the DC universe in the second season, but these five are the core five." Of course, you can't have ground-shaking action without powerful supervillains - and the Titans are in for epic face-offs against some classic baddies from their comic past, including Dr. Light and arch-nemesis Slade (aka Deathstroke). "You'll see Slade behind the scenes in the beginning, and we slowly reveal him through the first 13 episodes. He's after something that we don't reveal until the final two episodes of the season - and Robin is a big part of it. The season will end with a dramatic Robin vs Slade confrontation. "Cartoon Network has experienced great success with Justice League, so we know we have a loyal audience ready to embrace this exciting new show," said Jim Samples, General Manager and Executive Vice President, Cartoon Network. "These DC Comics characters have incredible powers, but struggle with how to use them. Teen Titans will mesh perfectly with our other action-adventure programming and thrill our viewers." "We are very excited about bringing Teen Titans to life with stunning animation," said Sander Schwartz, President, Warner Bros. Animation. "The opportunity to explore Robin, the classic sidekick of Batman, as well as the other teenage characters of the DC Universe provides a great setting for action-adventure tales for a new generation. " "The New Teen Titans was a groundbreaking comic book as Marv Wolfman and George Pérez delved into the extraordinary challenges of living as a super-hero teenager," said Paul Levitz, DC Comics President and Publisher. "With the animated series being brought to life by Glen Murakami's great team, we look forward to new worlds of creative magic." It looks like updates will begin weekly, starting on June 27 and ending July 28. Thanks to mattman33 for mentioning about the Fearsome Five: Jinx, Gizmo, Mammoth, Cinderblock and Clayface. Also, you can hear Puffy AmiYumi's song in the trailer. The Teen Titans Cartoon theme music is being done by Puffy or PuffyAmiYumi as they are known in the U.S.
Coming this August: the return of Puffy AmiYumi with NICE., an album of all-new material produced by Andy Sturmer that includes the theme to the upcoming Cartoon Network series, Teen Titans, more English language tunes, 15 minutes worth of live video footage from their 2002 Rolling Debut Revue tour of the U.S. and Canada and totally groovy cover art. To promote the launch of Cartoon Network's newest animated super-hero series on July 19, Animation Insider has joined forces with the ever-talented Bill Walko of Titans Tower to present Teen Titans Animated. Teen Titans Animated, part of the Animation Insider Network, is your destination for the most up-to-date news in regards to Teen Titans. While the series has yet to premiere, we are confident that it will become a true success for both Cartoon Network and in the minds of fans and non-fans alike. In the future, the site will feature character biographies, an episode guide, reviews and hopefully, interviews with the creative talent behind the series. Additionally, the official Teen Titans Animated for the present time will be our popular Superhero Shrine, administered by Bill Walko aka n8twing. In the future, look for another group of super-heroes to join our ever-expanding Animation Insider Network! Cartoon Network has released their July schedule information including information on the initial episodes of Teen Titans. The series premieres on July 19th, 2003, at 9:00pm (ET). Teen TitansCartoon Network will air new episodes in the regular 9:00pm (ET) Saturday slot, and then rerun the episode the following Saturday at 12:00pm (ET). Remember that the schedule is subject to change. Episode #3 "Final Exam" will air on July 19th at 9:00pm, and will reair on July 26th at 12:00pm. Episode #2 "Sisters" will air on July 26th, and will reair on August 3rd at 12:00pm. Episode #1 "Divide and Conquer" will air on August 3rd, and will reair the following Saturday at 12:00pm. 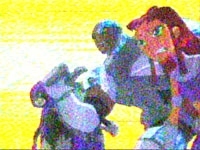 The Continuum has obtained three more images of Teen Titans, the new animated series from Warner Bros. Animation that will air on Cartoon Network and Kids' WB!. The series will premiere on Cartoon Network on Saturday, July 19 at 9 p.m. (ET). Similarly the villains all had to be very clear. No intergalactic Darkseid or netherworld Trigon. "The villains stay local. The world is never in peril," Register said. Indeed such topics may seem scary in the modern world anyway. "You can see that for real on CNN. So, on Cartoon Network we wanted to make the conflict more like your friendly neighborhood Teen Titans." 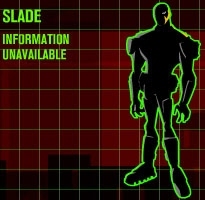 The primary villain, who is present in the first 26 episodes of the show, is Slade (known in the comics as Deathstroke, The Terminator). "We stayed away from Deathstroke, The Terminator because it's bad for kids," Register said, laughing. "What's cool about him is, he's sort of the bad Batman." Slade will confront the Titans directly in some episodes, where in other he'll dispatch a villain to fight them. Register named some of the other villains. May 3, 2003 | TT to WB in 2004? According to the Flash file, it shows that the TEEN TITANS ANIMATED SERIES is coming to WB in 2004. The previous report stated August 2003. The cartoon premiers on The Cartoon Network on July 19, 2003. The upcoming Teen Titans animated series should have a wide appeal, creators of the show said. "I wouldn't say it's like a boys show or a girls show," said producer Glen Murakami. "I wouldn't say it's for little kids or I wouldn't say it's for teenagers. I think everyone's going to like it." "You give parents something that they can enjoy with their kids, where they're not sitting there rolling their eyes while some sort of thing with a television in its stomach dances around," said story editor David Slack. 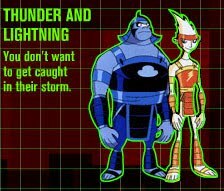 The show's creators made their comments in a Cartoon Network summer preview tape sent by the network to The Continuum. The series -- which debuts on Cartoon Network on Saturday, July 19 at 9 p.m. (ET/PT) -- will air on Cartoon Network as well as Kids' WB!, which was scheduled to air a preview of Teen Titans during its Saturday morning programming. "To Cartoon Network's credit, we were asked to do something that you almost never get asked to do in television," Slack said. "We were asked to take risks. Some of the only notes we got were, 'It's not weird enough. Make it cooler.'" Make it something that I haven't seen before." Cartoon Network will be premiering two brand new series this summer from Warner Bros. Animation. Animation Insider has learned that Teen Titans, a series following the adventures of a group of five adolscent superheroes debuts Saturday, July 19 at 9:00 p.m. (ET, PT). 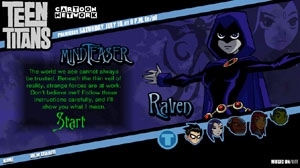 More screen shots of the TEEN TITANS ANIMATED SERIES are available on Titans Tower. Marv Wolfman's What Th--? : Letters, We’ve Got Letters! respond to a question regarding the TEEN TITANS ANIMATED SERIES and how the comic book is not the same as the cartoon. Interesting note: Marv Wolfman and George Pérez gets a small percent from merchandising. I have just update the photo section to include the sneek peeks of Static and Superman and the Teen Titans. So you do not have to wait until Saturday to at least see some images. so lets here what you think about it so far. Kid's WB aired snippets of the new TEEN TITANS ANIMATED SERIES this morning. From the 4 second promo, it looks pretty action-packed! Hear what Cyborg sounds like: You're in our house now!. Kids' WB! will show a preview of the Teen Titans animated series on Saturday, May 3. The network won't be showing an episode, but rather clips from the series, which will premiere on Cartoon Network in August. The show, which features Robin, Beast Boy, Starfire, Cyborg and Raven, will air first on Cartoon Network and then on Kids' WB!. The clips will be shown throughout the morning. Exclusive Teen Titans Live-Action Movie News! We broke the news six months before Cartoon Network and Kids' WB! made the official announcement that a Teen Titans animated series was coming, now we have the exclusive first word that a writer is on board a live-action film in development as well. We're hearing that the screenwriter on the feature film, produced by Akiva Goldsman, is Brad Fulmer, who was an assistant to "The X-Files" creator Chris Carter. Fulmer is said to be on his second draft of the script and it is unclear which Teen Titans teammates may be included in the story. DC Comics' "Teen Titans" made their comic book debut in 1964 and soon grew into its own monthly comic book series that ran for many years. It had different incarnations such as "The New Teen Titans" in the '80s and "The New Titans" in the '90s. 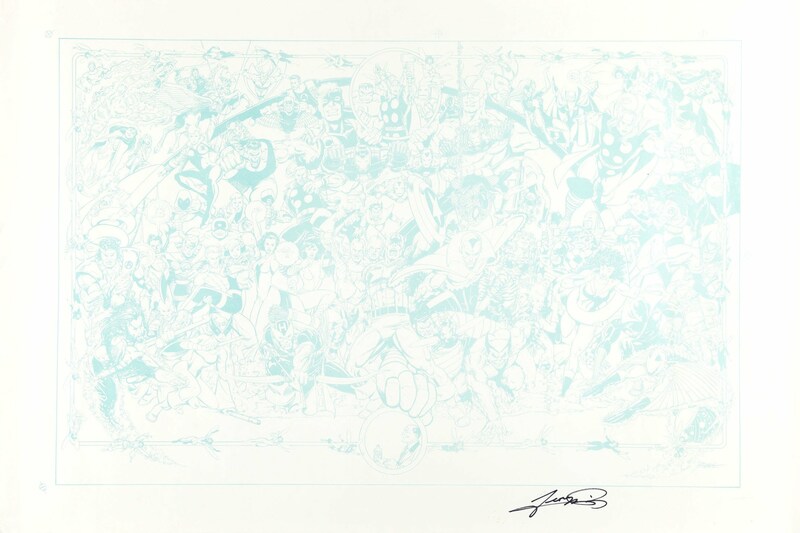 Characters have included Robin, Aqualad, Kid Flash, Wonder Girl, Raven, Changling, Cyborg and Starfire. The animates series will debut on Cartoon Network and Kids' WB! this August. I thought it would be interesting to find photographs of the voice actors that stars in the upcoming TEEN TITANS ANIMATED SERIES (2003). Note: the new animated image of Raven. Tara plays Stitch's girlfriend, "Angel" on an upcoming episode of "Disney's Lilo and Stitch." She is also on several other Disney shows including "Recess," "Kim Possible," the extremely popular series "The Proud Family," and, of course, the witty "Fillmore!" Tara has also completed a season of "Teen Titans." She plays "Raven." Tara has recorded various guest roles for episodes of "Ozzy and Drix" (KidsWB) and "Codename: Kids Next Door" (Cartoon Network), as well. Additionally, Dave will be a featured guest star on the new Lilo & Stitch animated television series for the Disney Channel, as well as a guest role on the new Warner Brothers animated series, Teen Titans, which will air on the WB. He will also star as the voice of Felix The Cat, The Professor and Rock Bottom in several upcoming Felix The Cat animated feature films for video release. Dave has also provided voices for Dexter's Laboratory on the Cartoon Network, as well as The Zeta Project for Warner Brothers. March 9, 2003 | TT Cartoon 2nd Season? Just heard through the grapevine - and this is NOT official or even news I've verified (but since when does the internet deal with facts?) - that the Teen Titans animated show, which will be premiering this spring, may have been renewed for a second season! Let's hope that's true. Although I wrote an episode for the first season I really have no idea how the show is going to look once it's been animated. The show, which is anime styled, is aimed at our younger folk, not at the teenage and older audience of the comics, and the characters, though they're based on George and my Titans' heroes and villains, are not quite the same as long-time comic fans will remember. Still, I'm keeping my fingers crossed that the people who brought you Batman, Superman and Static Shock will be continuing their high quality. In announcing its plans for the 2003-04 season, Kids' WB! released a new image from the upcoming Teen Titans animated series. Click on the thumbnail for a larger image. A new young breed of super-heroes comes to life on Cartoon Network as famed Robin The Boy Wonder leads fellow young teens Cyborg, Beast Boy, Starfire and Raven in the all-new high-adventure series Teen Titans. Slated to debut on Cartoon Network in August 2003, this action-packed half-hour animated series is being produced by Warner Bros. Animation under the guidance of Emmy Award-winner Glen Murakami. Teen Titans is based on the popular DC Comics comic book characters and will air subsequently in the 2003-2004 season on Kids' WB! Teen Titans features five teen super-heroes each with special powers, led by Robin The Boy Wonder. This group unites to form a defensive force to protect the Earth from a new generation of villains while coping with the problems of adolescence. An eclectic group, their powers complement each other so that when they band together, they become a superb fighting force. Their personalities, on the other hand, often clash. In order to protect Earth from a variety of enemies, these Teen Titans must learn to work and grow as a team despite their differences in style. Heading the cast of voice actors on Teen Titans is Scott Menville as Robin The Boy Wonder, the aggressive and acrobatic leader of the group. Greg Cipes provides the voice of Beast Boy, who can take on animal forms, while Starfire, who can channel energy into a powerful weapon, is played by Hynden Walch. Raven, who has psychic powers, is played by Tara Strong and Cyborg, the Teen Titans' half-man/half-machine strongman, is voiced by Khary Payton. Wil Wheaton and Ron Perlman provide voices for guest and recurring roles. "Teaming up with Warner Bros. Animation and Cartoon Network once again gives us an excellent opportunity to bring our core audience the newest high-adventure series, Teen Titans," said John Hardman, Senior Vice President, Kids' WB! "This series will be a perfect addition to our #1 line-up, as it features superhero action-packed adventures, comedy and kid-relatable characters and stories in this exciting new saga." "THE NEW TEEN TITANS was a groundbreaking comic book as Marv Wolfman and George Perez delved into the extraordinary challenges of living as a superhero teenager," said Paul Levitz, DC Comics President and Publisher. "With the animated series being brought to life by Glen Murakami's great team, we look forward to new worlds of creative magic." The Kids WB, the number one broadcast network in ratings for the youth demographic, announced an ambitious schedule for the rest of 2003. Unlike the other networks, the Kids WB adds new episodes during the summer in order to keep its series fresh. This strategy definitely worked last summer, prepping the way for the WB to dominate youth ratings in the kid "ghettos" of Saturday morning and weekday afternoons during the 2002-2003 season. The Kids WB's rating dominance is largely due to the success of the Yu-Gi-Oh! anime, which dominates Saturday morning as the top show for boys 2-11, and kids 2-11. Quite naturally, the WB is planning to add 52 new episodes of Yu-Gi-Oh! to its lineup for 2003-2004. Yu-Gi-Oh! will continue to be shown in the prime 4:30 pm daily and 10 am Saturday morning slots. 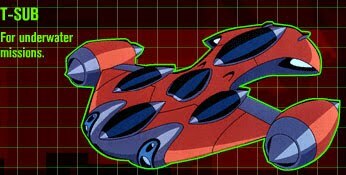 In spite of the enormous success of Yu-Gi-Oh!, the Kids WB is only adding one new anime series to its lineup this summer, Megaman: NT Warrior. In the fall the network will add the Warner Brothers-produced Teen Titans series, which will debut first on the Cartoon Network in August and then shift to the WB. The only other new series announced for fall sounds like an anime -- Xiaolin Showdown is its name, and it features a group of monks trained in the ancient art of Shaolin Kung Fu -- but this series is also being produced by Warner Brothers Animation, demonstrating, if only by imitation, anime's growing influence on children's programming here in the states. Cartoon Network on Thursday confirmed an August launch for the Teen Titans animated series. The half-hour series, produced by Warner Bros. Animation under the guidance of Emmy Award-winner Glen Murakami, will air subsequently in the 2003-2004 season on Kids’ WB! "Teen Titans features five teen superheroes each with special powers, led by Robin The Boy Wonder. This group unites to form a defensive force to protect the Earth from a new generation of villains while coping with the problems of adolescence. "An eclectic group, their powers complement each other so that when they band together, they become a superb fighting force. Their personalities, on the other hand, often clash. In order to protect Earth from a variety of enemies, these Teen Titans must learn to work and grow as a team despite their differences in style. "Heading the cast of voice actors on Teen Titans is Scott Menville as Robin The Boy Wonder, the aggressive and acrobatic leader of the group. Greg Cipes provides the voice of Beast Boy, who can take on animal forms, while Starfire, who can channel energy into a powerful weapon, is played by Hynden Walch. Raven, who has psychic powers, is played by Tara Strong and Cyborg, the Teen Titans’ half-man/half-machine strongman, is voiced by Khary Payton. Wil Wheaton and Ron Perlman provide voices for guest and recurring roles." “We are very excited about bringing Teen Titans to life with stunning animation,” said Sander Schwartz, President, Warner Bros. Animation. “The opportunity to explore Robin, the classic sidekick of Batman, as well as the other teenage characters of the DC Universe provides a great setting for action-adventure tales for a new generation. " A new breed of superheroes comes to life on Cartoon Network as Robin the Boy Wonder leads fellow young teenage superheroes Cyborg, Beast Boy, Starfire and Raven in the all-new high adventure series Teen Titans. Slated to debut on Cartoon Network in August, this action packed half-hour animated series is being produced by Warner Bros. Animation under the guidance of Emmy Award-winner Glen Murakami. Teen Titans is based on the popular DC Comics comic book and will also air in the 2003-2004 season on Kids’ WB! Some major announcements focussed on the previously announced properties like Duck Dodgers and Teen Titans. The network revealed Duck Dodgers, the new animated series staring Daffy Duck as a poor man's Buck Rogers mixed with Flash Gordon, will premiere from Warner Bros. Animation in July. The Teen Titans, based loosely on DC's New Teen Titans, but modernized a tinge, will make its debut this August. Andrea Romano, voice director of Cartoon Network's Teen Titans, told The Continuum that work on the show is going smoothly and on pace for its August debut. "We've got a terrific show," Romano told The Continuum. "There are hopes that we might get another 13 episodes right away." Romano said that the last episode of the original 13 will be voice recorded on Friday. The main cast of Teen Titans includes Scott Menville as Robin, Tara Strong as Raven, Greg Cipes as Beast Boy, Khary Payton as Cyborg and Hynden Walch as Starfire. Strong, who was one of the actresses who provided Batgirl's voice, is really the only Teen Titans cast member with extensive experience in this genre. "They're terrific, just wonderful to work with," Romano said of the youthful cast. "It's sort of a clean slate. There are no preconceived notions and no one is jaded." Romano said that Malcolm McDowell (Metallo on Superman) recorded a guest role two weeks ago. According to Cartoon Network, "Teen Titans" which was just announced Tuesday as premiering this May, has now been pushed back to August, time and date to be determined. Although a reason was not given, it might be due to a delay from Warner Brothers Animation. Animation Insider will try and keep you updated on the delay. Stay tuned for any further developments. The Teen Titans animated series will premiere on Cartoon Network on Friday, May 30 at 8 p.m. (ET/PT). It is unclear if the premiere episode will be longer than 30 minutes. The show will feature Robin, Cyborg, Raven, Beast Boy and Starfire. "This group unites to form a defensive force to protect the Earth from a new generation of villains. An eclectic group, their powers complement each other so that when they band together, they become a superb fighting force. Their personalities, on the other hand, often clash. Discovering how to control their powers, these Teen Titans must learn to work and grow as a team while dealing with the trials and tribulations of being teenagers." Teen Titans will also air on Kids' WB!. NRAMA: Speaking of Spider-Man a little, but moving back to DC, with the success of Marvel’s movies and other media properties, Marvel has slowly, but enough to be noticeable to fans, moved the comic versions closer to the movie versions of the characters. DC seems to be doing this a little with Teen Titans, in canceling Young Justice to reassemble a Titans team that is in line with the upcoming animated series team; as well as with Smallville, in that Superman’s past has come into play in a handful of recent stories. Is there a level of control exerted over DC by other arms of AOL-TW? PL: I think that questions is about three questions rolled up together. Question 1, I think on the narrow specific of the Teen Titans, the relaunch of the comic and the new animated show both look back to Marv and George’s work as an emotional starting point on some level, but boy, do they go off in polar opposite directions. I’m hard pressed to remember an occasion on when we’ve had two more radically different interpretations of one of the properties going at the same time. So I don’t think they’re evidence of a grand plan to make it all follow one set of model sheets. The anime-influenced visuals that Glen Murakami came up with for the animated show, and the very kid/bouncy/energetic style that’s being used in the scripts take advantage of a lot of animation is great at that doesn’t always translate well to comics. Comics2Film recently heard from a credible source who got a look at some of the work that's being done with the Teen Titans animated TV series. This is the same source that accurately informed us back in June that the core team would be composed of Beast Boy (Changeling), Raven, Cyborg, Starfire and Robin. Now, that source is able to tell us who some of the guest characters will be. It wouldn't be Teen Titans without Slade Wilson, better known as Deathstroke, The Terminator. This character was introduced in the second issue of the Wolfman/Perez series and became an integral part of the Titans mythos. Our source tells us that Wilson will be a key player in the animated show, acting more as a mastermind plotting against the Titans, and occasionally going into action as Deathstroke. Fans can also look for an episode centering on the destructive Vietnamese due of Thunder and Lightning. These characters first appeared in the third year of Marv Wolfman and George Perez's New Teen Titans. In that book they were depicted as young men with out-of-control super powers searching for their long-lost father. Eventually their involvement with the Titans allows them to learn the truth about their father and get their powers under control. Our source is unsure how much the story adheres to the comic books, but she did say that the show's producers seem to be going for a Crouching Tiger, Hidden Dragon feel to the episode. Our source also revealed that at least one episode will feature frequent Titans foe Dr. Light. No other details about that one are available. "It's all of my characters, including all the villains, but it's really being aimed for a very different audience," he said. "In comics (which, first of all, you have to be able to read), we aimed the Titans for high-school and college age, and The Cartoon Network and The WB really wanted this version of the Titans aimed at junior high and younger. So it's a very different series, even though it features a lot of the same characters." Wolfman had pitched the concept of recasting the criminal scientist Luthor as a ruthless business tycoon when he wrote the Superman feature in Action Comics in the early 1980s. (When that was rejected, Wolfman adapted it using Vandal Savage.) 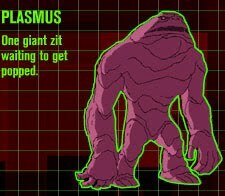 The concept later was adopted for Luthor as part of the 1986 reboot of the Superman titals. "If you try to take him on with super-suit or giant robots, you're going to lose - he's Superman," Wolfman observed. "The idea was to use Luthor in such a way that Superman would be helpless to combat him." During a joint panel at Mid-Ohio-Con, Marv Wolfman and Len Weign announced they have collaborated on the screenplay for a movie, Gene Pool, which is in development. Both writers also have upcoming projects that reunite them with some of their most famous characters. Wolfman has written an episode of the new Teen Titans animated series which features several of the characters Wolfman created with artist George Pérez for the New Teen Titans series in the '80s. He said he also is working on a He-Man mini-series. If you liked what George and I (as well as the other artists who followed George) did, then you may like or not like the animated series when it begins next year. I haven't seen any episodes - they haven't been animated yet - so I'm not about to say it's a great show or something less. I have no view over what I haven't seen. As for what I can say in response to the first question above (Why do you Like (sic) the Titans cast for the show?). Well, they're all good actors and were very nice to me, that's why. As for being upset by a change in continuity? C'mon, the kinds of things I did and believed in for the comic could never be done in a cartoon show for little kids. Will the animated show be good? I certainly hope it is. I like the people working on it and I'm certainly open minded enough to wait and see what they do. Even if it turns out that the show is completely different from the stories I wrote for 16 years, it will need to be viewed on its own merits and not whether it is a perfect translation of my deathless prose. Obviously, I'd love to see a show that perfectly reflects everything I did, but even if such a thing happened, I bet whoever wrote the letter above would still have problems with it. The show is based on the DC comic George Perez and I created back in 1980 and features many of our characters, villains included. There are changes, of course. While our Titans was written for a teenage and older comic book reader, this show is written for the younger TV audience. Several of our characters have origins that are a little excessive for the Kids WB where it will be shown (along with The Cartoon Network). For instance, in the comic, Raven's mom was raped by an inter-dimensional demon and Starfire was sold into slavery by her father. Not exactly kiddie fare. This show emphasizes action and fun. All the Titans favorites are here: Robin, Beast Boy (I still prefer the name Changeling) Cyborg, Raven and Starfire. I hope people will like the show when it airs sometime next year. 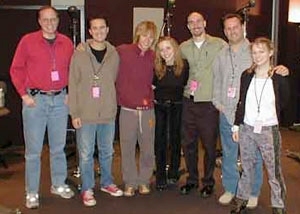 From left to right: Marv Wolfman, Wil Wheaton (Aqualad) , Greg Cipes (Beast Boy), Tara Strong (Raven), Scott Menville (Robin), Dave Coulier (Tramm), and Hynden Walch (Starfire). Not pictured: Khary Payton (Cyborg). So here's something unexpected: I did a voice today on this new show called "Teen Titans." The call came on Friday, and here's the cool thing: the director, a wonderful woman named Andrea Romano, who has won seven emmy's called my agent and requested me, based on my work with her last year on "The Zeta Project." I did the voice of "Aqualad," and I was told when I left today that they were so happy, I would probably be asked back to do the role again in the next thirteen episodes. The episode I did was written by this really nice guy named Marv Wolfman, who co-created and wrote for "Teen Titans" for sixteen years, created "Blade," and was just an all-around cool guy. We spent some time geeking out about comic books today...it just killed me that he was referring to Alan Moore as "Alan." Talk about a titanic acquisition. Cartoon Network and the Kids' WB! Have teamed up to produce a brand-new, half-hour animated series based on DC Comics' classic comic property, Teen Titans. Set to debut sometime in 2003 (premiere date and airing times have yet to be scheduled), "Teen Titans" borrows heavily from the 1980s New Teen Titans era by writer Marv Wolfman and artist George Pérez, notably in the cast, which consists of Robin, the Boy Wonder, Cyborg, Starfire, Raven and Beast Boy (a.k.a. Changeling). However, while New Teen Titans often dealt with serious teen issues like drug abuse and runaways, the "Teen Titans" cartoon will have the five heroes banding together in a future era to protect Earth from intergalactic strife and interplanetary battles. "I know they made a lot of changes, both visually and conceptually," noted Pérez. "But considering how long I've been away from the book and how many changes have been made since Marv and I worked on the series, the idea that they're giving a little tip of the hat by using the characters that Marv and I created… I'm tickled!" Heading up production on "Teen Titans" will be Emmy Award-Winning Producer Glen Murakami, who scored big successes with his work on "Justice League" and "Batman Beyond." "With the animated series being brought to life by Glen Murakami's great team, we look forward to new worlds of creative magic," said DC Comics President/Publisher Paul Levitz. For those not familiar with the comic book version of the young heroes who make up the Teen Titans, check out the rundowns of each characters in the call-out captions below! CYBORG When Vic Stone was injured in an explosion at S.T.A.R. Labs, his father replaced the ruined parts of his body with cybernetic implants, which gave him super-strength, enhanced speed and a wide variety of special weapons, including lasers, sonic disruptors and advanced computer hardware. RAVEN The daughter of an Earth woman and other-dimensional demon, Raven possesses vast empathic and healing powers, can travel inbetween dimensions and has the ability to unleash her "soul-self", which can force an enemy to be overwhelmed by his or her worst fears. STARFIRE Koriand'r hails from the proud warrior planet of Tamaran, where all her race can convert solar energy into flight. But when she was kidnapped by the evil Psions their expierments granted her the ability to store untold amounts of energy and unleash devastating blasts! BEAST BOY After undergoing an experimental medical treatment to save his life, Gar Logan (also known as the Changeling in the comic series) gained the ability to transform his physical structure into any animal he could imagine. ROBIN, THE BOY WONDER Batman's trusted partner and ward, Robin acts as the Teen Titans' leader, utilizing his superb technical training, computer skills and high-flying acrobatics to reach the heights of human protential. Related links: www.wizardworld.com, www.kidswb.com, www.cartoonnetwork.com. Cartoon Network’s Justice League series will get some younger company beginning in 2003, as the network today announced that it will debut an animated Teen Titans series. The team will be made of the Titans of the Wolfman-Perez era with a few modifications, and include Robin, Cyborg, Beast Boy (using his original Doom Patrol-era name which was changed to Changling in the Wolfman-Perez run and later changed back), Starfire and Raven. Kid Flash and any young character related to the Wonder Woman mythos apparently will not be members of the team, at least at its beginning. The half-hour animated action series is being produced by Warner Bros. Animation under the guidance of Glen Murakami. The series will be rebroadcast on Kids’ WB! following its showing on Cartoon Network. "Teen Titans is based on the popular DC Comics comic book characters. Teen Titans, set in a future of intergalactic strife and interplanetary battles, features five teen superheroes each with special powers, led by the Boy Wonder Robin. This group unites to form a defensive force to protect the Earth from a new generation of villains. An eclectic group, their powers complement each other so that when they band together, they become a superb fighting force. Their personalities, on the other hand, often clash. Discovering how to control their powers, these Teen Titans must learn to work and grow as a team while dealing with the trials and tribulations of being teenagers." Finally our inside source said the current line-up for the team is Changeling, Raven, Cyborg, Starfire and Robin. Robin will be the younger, Tim Drake version seen in the latter episodes of the Batman animated shows. However, our source cautions that the show is still in development and plans may change. Finally, a source at Weed Road Pictures told C2F that the animated show is not related to their planned live-action Teen Titans feature and one project does not effect the other. Currently Weed Road is seeking a writer for the project. As you know, Marv Wolfman and George Pérez created the (new) Teen Titans, so it should be interesting to see how (and if) the animated show will be handled. I'm kind of curious which Starfire costume they're going to use. As far as I know, I don't think either Wolfman or Pérez is working on the two above projects.